a bit of glitter | Live a life worth writing about. Hey guys! I’m HOOOMMEEE! I have of course accumulated a cold since I’ve been back so I couldn’t post yesterday, but I’m here today! I have some ‘I don’t know how you are going to take this’ news…SOFC is gone…SORRY! It honestly hasn’t been as good as I thought it was going to be…and it has ended up being a chore for me to do everyday instead of something fun. I am still going to be posting all of the posts that were planned for the future, but they just all won’t be in the same setup as SOFC. I think it is going to work out so much better! Anyways, I am going to be starting a new mini series for back to school! I am going to be showing you guys some must have fashion pieces for the first instalment! 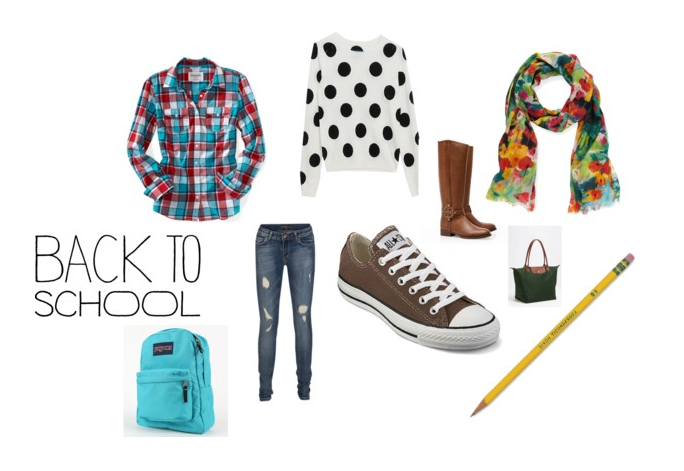 I didn’t want to put up tons of things because I will be doing a fall fashion Polyvore set once fall comes closer! Anyways, I hope you guys enjoyed! I should have a post up tomorrow! Thanks for reading! Bye! Hey guys! I’m home! I made it in one piece, but my neck is absolutely killing me, it feels like my head is really heavy. Have any ideas why? Anyways, that’s not what this post is about! So last week I was looking a lot of craft gawker and Pinterest (when do I ever not…), and found a tutorial on how to make customizable shirts with very few items that are pretty easy to get. It is basically telling you to use Elmer’s Gel Glue on a T-Shirt in the pattern/writing/drawing you want, and then dye the rest of the shirt. The glue leaves the print on, and the die is around it. How cool is that!? In the tutorial they used quotes on the shirt, and I am going to do that too! Summer is almost here and I am ready to get my DIY on!! They seem really easy and inexpensive to do, so I think I am just going to go to Old Navy and clear out the plain shirt section! Stay tuned for another DIY idea coming soon! Let me know if you try this out and what you drew/wrote on yours! Bye! Everyone knows that bright colours are a huge hit for summer time. You can easily incorporate it into your wardrobe. You can go all out by buying outfits that are all neon (including colour blocking? ), or you can find a cute small bag that adds a pop to your outfit. Do you like adding bright colours to your closet?! Let me know in a comment! It’s Summer! I have decided that I wanted to do two Summer Must Haves posts. I am going to do the Summer Besties TAG, and then have a randoms must haves for summer. Here we go! I’m not going to go through them really, because I’m going to save that for the real posts! There’s a lot of colour, and it incorporates some big trends for the summer. I will talk to you guys soon! I will have the Summer Besties up in a little while! Oh, and btw, I think I am going to start a inspiration series (for mostly beauty), and a trend to try series. Let me know what you think! What’s your favourite season for trends!? Let me know! Here’s my latest post: Some Sparkle: My Current Wishlist- May 2012! So this season there’s a lot of colour. Not only with the outdoors, but with fashion. Colour is everywhere! A trend that has been really popular lately is bold lips. Pink, coral, orange, red, raspberry, fuchsia, anything! Personally, a lot of those colours don’t look good on me because I am a redhead :(. I can always pull off coral and orange though! The best thing to do with this trend is to wear very minimal eye and makeup, and then perfect the lips. Here are a few examples of the bold lip trend. Maybelline Lipstick in Are you red-y? OK, talk to you tomorrow! I hope you enjoyed! (: Goodnight. A Bit of Glitter: DIY Lip Scrub! Hi hi! Headache’s gone, out to post!! Who doesn’t like chapped lips!? EVERYONE! Here’s an awesome way to get smooth lips for summer! 1. Mix all ingredients, and spoon it into the pot. There should be more sugar then oil. 3. Let sit for a few minutes, just to set. Let me know if you try it! Talk to you soon! DIY Body & Face Scrubs! Some Sparkle: 10 Little Secrets TAG!